Bohol continues to assert its dominance as a province of endless possibilities for tourism activities when it opened Visayas’ first wakeboarding facility in Pandanon island, Getafe. Bohol now joins the elite league of Camarines Sur and Batangas, two known wakeboarding destinations, entrepreneur Michael Tan of the Board Shop said. The Board Shop is the wakeboarding outfitter and accessories’ company who helped set up the facility in the neat white sand bar in Pandanon. Governor Edgar Chatto cut the ceremonial ribbon to officially get the facility running, at 1:00 p.m. Saturday. It also signaled the official start of First Bohol Wake Fest, a wakeboarding competition participated in by local and international wakeboarding enthusiasts. Wakeboarders took turns literally in pulling out the most spectacular “tricks from their hats” while towed by cables set up by a computer run program called Sesitec 2.0. It is an aqua sport developed by combining skills of snowboarding, water skiing and wind surfing techniques, in which the rider uses balance to perform tricks on the wake while being towed by a speeding boat. For environmental considerations however, the Getafe facility uses a closed-circuit cable-course where computer controlled specifically designed cables tow the riders at certain speeds to get the wakeboarders skimming on top of the water. 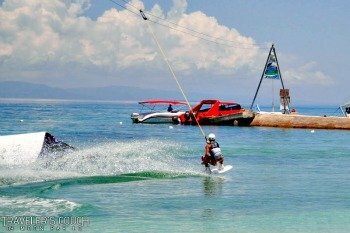 Governor Chatto, who is a staunch advocate of Bohol’s vision of becoming an eco-cultural tourism destination, hailed the people who developed the wakeboard cable park, which provides more options for tourism in Bohol. Chatto, who is one of those who conceptualized the campaign slogan “It’s All in Bohol,” said Bohol must not stop developing new tourism products to remain competitive. At the sidelines of the competition, Getafe Councilor Tonypet Ouano revealed that they would re-assemble the wakeboarding facility near the mainland in Getafe, while the set up in Pandanon is testing the waters for the aquasport viability. “The opening up of the competition in Pandanon is a strategy to promote the sport, get Getafe onto the tourism map and open up international consciousness among tourists to experience Pandanon,” Ouano, whose family owns the only beach resort in the island said. “It was a bold move,” admits Getafe Information Officer Nelson Socias, who added that the wakeboarding facility in Pandanon uses power generators to run the cable motors. Putting the wakeboard cable park on the mainland in Getafe, where cheaper power is easily available, would certainly put Getafe on the tourism map, Socias added.